King's Cross Tube announcments by Black Adder narrator shock! Is it just me, or had anybody noticed that the stern, authoritative and slightly hectoring tone of the very serious announcer at King's Cross tube is the same voice as the narrator on the original set-in-Medieval-times first series of The Black Adder? I absolutely swear that the disembodied voice who says 'Ladies and gentlemen, there is now a good service on the Piccadilly Line," with such gravitas is the same guy who introduced The Black Adder with all that cod Shakespeare nonsense about "out of the mists of history..."
I'm afraid this means I just can't take the recorded announcements by Patrick Allen (not credited in the original transmission of the series) at all seriously, as I half expect it to degenerate into some prologue about the "Witchsniffer Persuivant". I went backstage at the Natural History Museum last Thursday (10th May) to check out the Bate Collection, a dawn of the twentieth century collection of the remains of the pygmy elephants that used to inhabit the islands of the Meditarranean. We reckon they were about three foot at the shoulder, and the babies may have been the size of large cats. I was researching for a future Fortean Times feature on pygmy elephants, including reports of living ones in Kerala State, India, and Congo Brazaville. Victoria Herridge, who's studying the evolutionary biology of dwarf elephants and who was my guide to the Bate Collection, was surprisingly unbothered at the suggestion of living very small elephants out in the Congo, saying that we know so little about the forest elephants that live there, they're retiring, they live in the deep forest, there are wars going on there, nobody can get out there, so she felt it was quite possible. She added that there is a big known size range in known living species of elephant anyway. The article will be out sometime this year hopefully, and in the event of any speakers dropping out of the Centre for Fortean Zoology's Weird Weekend conference this August, I am on the substitute bench to deliver a talk on this myself. The pictures show an adult tooth of elephas antiqus falconeri from Cyprus (by comparision, modern African elephant cheek teeth are well over a foot long, the "Micromammals" label on the drawer in which specimens are kept, and an open drawer of Cypriot adult pygmy elephant teeth. We saw a fossil "milk tusk" -baby elephants have an early set of tusks that they shed. The pygmy milk tusk was about the size of one of those short pencils you get in IKEA. My pictures are rubbish compared to those of my colleague Isabelle Merimond, a pro, whose much better pics will illustrate the feature. Now I've seen everything. This video I spotted for sale in an Islamic bookshop in Brick Lane appears to be aimed at children, and bears the title Finding Courage. I may be completely wrong, but it appears to show an Islamic muppet diligantly studying the Koran. Older readers will note his resemblance to Scooter from The Muppet Show. 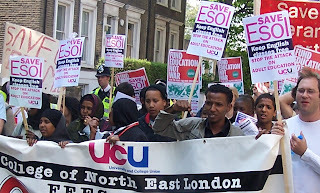 About 800 people - mostly students and teachers of ESOL (English as a Second Language) attended three feeder marches and a rally in protest against cuts to free ESOL provision in England generally, and London in particular. The push to get migrants to sign up to ESOL classes, delivered free of charge using the Basic Skills Agency Skills for Life curriculum, has been the most successful educational intitiative of the Labour government, with ESOL tripling in both the numbers of students entrolled and the total budget since 2000. 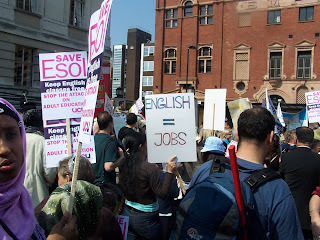 So there was widespread bemusement when, in October, Minister for Lifelong Learning Bill Rammell declared that the demand for ESOL classes was "unsustainable" and announced that ESOL students not eligable for Working Tax Credits would have to pay at least a third of course fees, and that asylum seekers would no longer be eligible at all for ESOL classes. A concerted lobbying campaign followed, with many ESOL teachers taking advantage of the so-called Citizenship strand embedded in the ESOL curriculum to get their students to write their first ever letter to their MP (in class time) to protest these changes. There followed a huge lobby of Parliament (about 1,000-strong) by ESOL students and teachers in late February by ESOL students and teachers, big enough to overwhelm Parliamentary security who shut down the visitor's entrance to the House of Commons. And there were debates on ESOL in the Lords and the Commons. Concessions followed, with Minister Rammell announcing that the much more straightforward Housing Benefits form would be used as an indicator of 'low income' in deciding whether students for free evening classes, and that asylum seekers who had been awaiting a decision for over six months could get on ESOL classes. But these concessions were pretty much cancelled by recent news that London, where over half of all UK ESOL classes take place, would see a £25 million cut in Further Education (FE) for 2007-2008, which would mean that ESOL teachers would be laid off and some classes closed. This was the background to the march and rally. 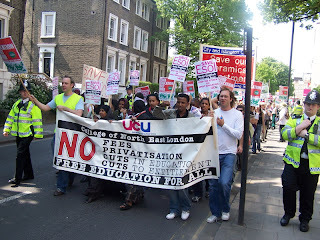 There were three feeder marches - Highbury (which included students and teachers from City and Islington College, and Haringey's College of North East London) which marched along the Balls Pond Road to meet two more feeder marches from Hackney and Tower Hamlets. Latin American cleaners working around Canary Wharf and organised in Justice for Cleaners, a group set up by the Transport and General Workers Union, were a noticeable contingent on the Highbury march. Jake from Justice for Cleaners told me that they were starting up ESOL classes for cleaners through the union's new Migrant Support Unit (earlier attempts at starting up ESOL classes for their membership through an FE College were "confounded by bureaucracy"). He addes that promotion to supervisor level among cleaners seems to be entirely down to their level of English. There was also a large Somali presence on the march. Many Somali women couldn't read or write only a few years ago, and are now becoming much more confident in expressing their needs. For many of them, this was their first demo, and when a petition came round, some asked what it was - they'd never seen one before. Many of the banners and placards emphasised the contrast between the money available for the war in Iraq with the lack of money available for education. A early teenage street gang from Highbury joined in the march for a laugh, joining in chants of "Tony Blair, it's not fair!" At Hackney Town Hall, a brass band struck up The Red Flag. Hackney Council officials ordered demonstrators off the steps - their was a wedding coming out. Hackney Mayor Jules Pipes had reportedly telephoned the police earlier asking them to ban the march completely from the square in front of the Town Hall, but the police had refused, and stewarding was low-key. The "2008 ESOL Choir" paraded with their mouth duct-taped up. With local elections approaching in other parts of the country, activists from Respect and the Green Party both told me they had propaganda leaflets about ESOL printed up for the elections. Oli Rahman, a Respect councillor in Tower Hamlets who spoke on behalf of George Galloway MP, who couldn't make it, said he would put up a motion in the Council opposing the ESOL cuts. Trish Smith, of the Adult Learning Service and the Learning Trust, said it had been proven time and time again that "children will do better if their parents can support their education" for which they needed English, and that cuts to ESOL would affect the "skills targets" London had set itself for the 2012 Olympics. 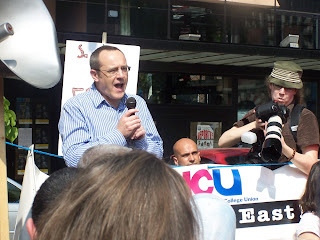 College managements rarely stick their necks out in opposition to government policy, but the star speaker was Ian Ashman, Principal of the local Hackney College. He pointed out that the money from the ESOL cuts would be shifted into workplace learning scheme Train to Gain, and that "60 % of Train to Gain money is not being spent." 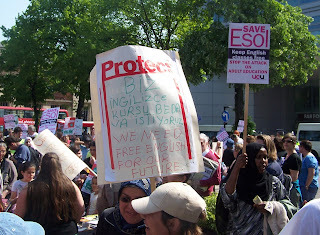 Turkish-Kurdish groups were well-represented on the march, including the Anatolian Peoples Association whose banner read: Free English Language Tuition is a Right. One Turkish woman had a placard which read Inglizce Ogrenmek Hakkimizdir, which she translated as Learning English is Our Right. There were many bilingual or multilingual banners. Documentary maker Nick Broomfield, who made "Ghosts", an investigation into the Whitley Bay Chinese cocklers, sent a message of support in which he said, "While making Ghosts I realised that one of the biggest problems was language. Many did not have enough English to have a conversation. Many illegal Chinese are skilled doctors and jewellers but they cannot make their skills known." Jeremy Corbyn MP (Lab, Islington North) described the policy on ESOL as "a no-brainer" and demanded that "if the government insists the people should have a reasonable standard of English - give then to tools to do it!" Last week, London Mayor Ken Livingstone made a surprise announcment that he had found £15 million to "save" ESOL in London, £10 million from the local development agencies and £5 million of the Mayor of London's budget. The Mayor of London doesn't even have a formal responsibility for education, and it's the biggest Mayor of London spend on education yet. Some see his intervention as a power struggle with the London Learning and Skills Council, an attempt to take it over and put it under Mayor of London control. (It's a central government agency at the moment.) College Principals began announcing redundancies among ESOL staff that week, and some have since had to announce that these are delayed. Then later in the week, the Department for Education and Skills announced £35 million for ESOL in London. £15 turned out to be Livingstone's money already pledged, and the remaining £10 million was split between the already dodgy-looking Train to Gain and "new" ESOL classes. In any event, ESOL has suddenly become very political. Save ESOL march, Hackney April 21 2007. Report follows shortly.